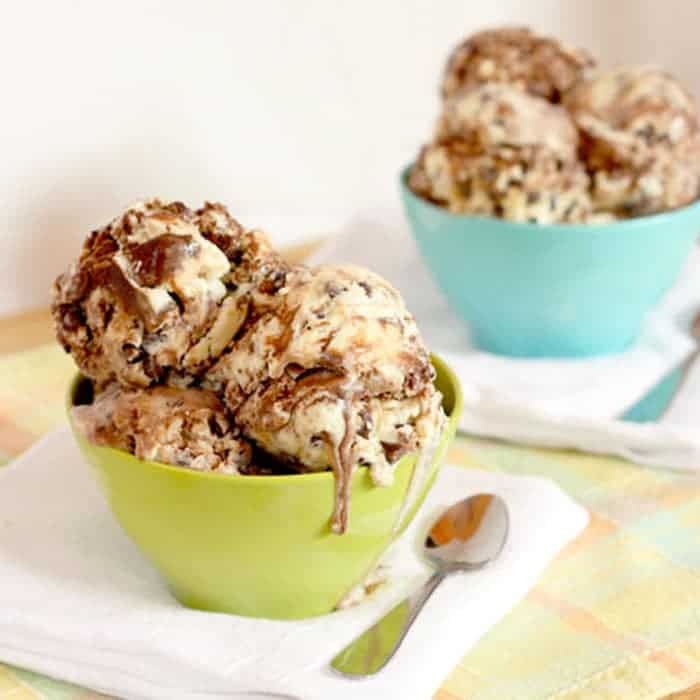 A creamy no churn sweet and salty dulce de leche ice cream with chocolaty ripples and chips. 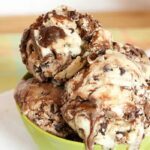 Salted ripple chip no-churn ice cream is one of the easiest and most delicious no-churn ice cream recipes on this website! “Your Love is Better Than Ice Cream…” Even better than Salted Ripple Chip No-Churn Ice Cream. Make that Salted (!) Dulce De Leche (!!) Fudge Ripple (!!!) Chocolate Chip (!!!!) No Machine Needed (!!!!!) Ice Cream!!!!!! But I had to shorten it up because, just like a hit song, recipes title have to be catchy. And this certainly applies today since this week’s #SundaySupper is all about recipes inspired by music. Originally published on August 4, 2013, and updated on July 10, 2017. And there aren’t many things that I love more than ice cream. Except my boys, and especially The Hubby. And guess what?!?! August 10th, 2013 marks 10 YEARS (!!!) since The Hubby and I started dating. Before we jump into the salted ripple chip no-churn ice cream recipe, I have a sappy happy love story to share. I’ve gotta tell you, at first, I totally couldn’t stand the guy. Heck, I like strawberry ice cream (which I don’t like at all) more than I liked him. We worked together (shhh… I actually worked for him for a short time) and he was 10 years older than me and gruff and serious and totally geeky. Absolutely, 100%, definitely someone with whom I would never ever ever be anything more than coworkers, or possibly friendly acquaintances. But then the “Summer of Softball and the Shore” happened. We had a softball league at work. A few guys from our department started a team, and both The Not-Yet-The Hubby and I decided to play. Our team was awful, but we had a blast laughing at our awfulness, and even more of a blast during our post-game dinners and drinks at The Waiting Room. Then the group started planning weekend trips down the shore (yes, I am from New Jersey. We don’t go to the beach. We go down the shore). And during all of these fun times, The Not-Yet-The Hubby and I started talking more and more, getting to know each other better and better. And in the summer warmth, just like melting ice cream, all the things I thought I didn’t like about him started melting away. Somewhere in the middle of the summer, he declared his feelings for me in a handwritten note. I just wasn’t ready. But he didn’t back off completely. He gave me just enough space to come around. And one day he asked me if I wanted to catch a movie with him. Then afterwards he took me to my (unbenownst to him) favorite ice cream place, Thomas Sweet. I don’t know what changed that night. Maybe it was the fact that he totally guessed what I was going to order, even though I decided to order something completely different from what I usually get. All I know is that was the beginning of a lifetime together. And the first of lots and lots of ice cream dates, which we still do to this day. ss – job, house, bills, kids – he’s always on top of things and getting stuff done. And geeky is cute, right?! But you know how I knew he was a keeper? 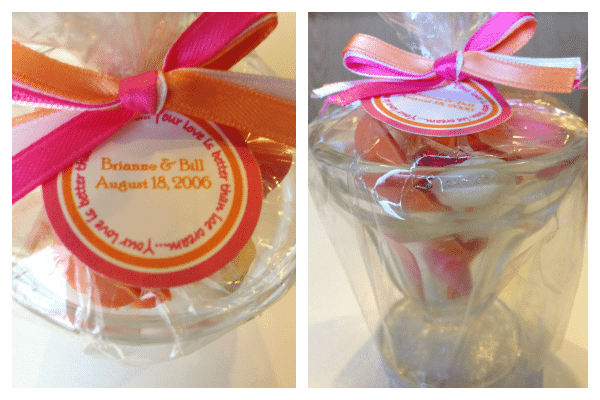 See these wedding favors? And those teensy-eensy bows? Yeah, he and his big ol’ fingers helped me tie 150 of ’em. Without complaining. Because it made me happy. And all he ever wants, even in our hardest times, when our kids have us wound up and exhausted, when we disagree about where to go and what’s a priority and what color siding we should get for the house, when we think we want to strangle each other, is really just for me to be happy. Notice the little nod to our first ice cream date with the lines from Sarah McLachlan’s song? Yep, The Hubby’s love may be better than ice cream and chocolate. But, this SALTED RIPPLE CHIP NO-CHURN ICE CREAM, you guys. Oh my goodness oh my goodness. So rich and creamy. Sweet, but with the perfect balance of saltiness (kinda like The Hubby). Chocolaty ribbons with some fudgy chunks. Loads of chips, because I am weird, and like to crunch my ice cream. Holy cow, it is almost embarrassing how much of this no-churn ice cream recipe I consumed myself. And of course my friends have more ice cream and chocolate goodness for you, like these Chocolate Chip Cookie Cones from Love from the Oven. Double Chocolate Chip Cookie Ice Cream Sandwiches from foodiecrush are doubly delicious. And this Cherry Chocolate Chip Ice Cream Cake Roll from Barbara Bakes, well, that’s how I roll. I think it’s safe to say that this salted ripple chip no-churn ice cream recipe will withstand the love test. Pour the entire can of sweetened condensed milk in a bowl on top of a double boiler and place over a pot of simmering water. Cook over low heat, stirring occasionally, for 1-1½ hours, or until thick and light caramel colored. Cool to room temperature (about an hour). Stir in the sea salt and ½ cup heavy cream. Whisk together the water, cocoa powder, and corn syrup in a small pot. Bring to a boil, stirring frequently, then reduce heat to low and simmer for about 5 minutes. Remove from the heat and add the chocolate chips. Stir until smooth. Place in the refrigerator until ready to use, cooling at least to room temperature (it will be fairly liquidy, not thick). Pour the 1½ cups heavy cream in a large bowl and, using the whisk attachment of a stand mixer or a hand mixer, beat until stiff peaks are formed. Gently fold in the cooled dulce de leche, then gently fold in the chocolate chips. 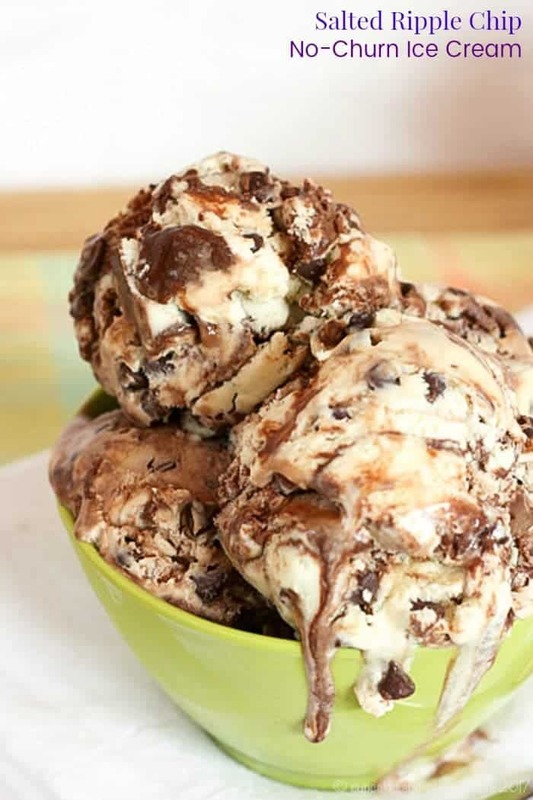 Pour half of the ice cream mixture into a freezer-safe container and top with about half of the fudge ripple mixture. Swirl with a knife or skewer. Top with the remaining ice cream mixture and fudge ripple mixture, and swirl with a knife or skewer. Cover and freeze for 4-6 hours, or overnight. Enough talk of my salted ripple chip no-churn ice cream! Here’s the rest of the #SundaySupper musical menu for this week. Happy Dating Anniversary! Well, who wouldn’t love ice cream especially this salted ripple chip?! We tried this yesterday and it was so good. It is a perfect mix of something salty and sweet that you don’t really want to stop eating. Thank you for sharing this recipe. Thank you, Shelia! I’m so happy to hear that you enjoyed the salted ripple chip no-churn ice cream recipe. It’s one of our favorites! I had to pin this! It looks so, so good! Love homemade ice cream! Haha, thanks! Although I’ll eat ice cream in any weather! And this ice cream?! Oh my gosh. So much happening at once. And I love it! Thanks Erin! Sometimes you just don’t know what you’ll find below the surface. Just like this ice cream – lots of surprises. Brianne, this sounds amazing and I’ve been meaning to try an Ice Cream recipe that doesn’t require a machine. This might just be the one! Thanks for sharing at Thursday’s Treasures, I’m featuring you this week on the blog and FB! Thanks so much Joan!! These no-machine ice creams are so good, albeit about dangerous because they are too quick and easy. What an absolutely adorable and cute story about your hubby! I love that he helped tie all those favor bows too…he’s a keeper! And this ice cream? Seriously I wish it was in my freezer right now. I love the drippy yumminess that you captured!!! Wow, Brianne! This ice cream sounds amazing!!! Thanks Heidi! It was pretty incredible. OK, seriously want this, like NOW. I never make ice cream because I hate the machines. I have never had one that worked well, and am totally over it. SO happy to see I can make this without one! 10 years, that’s so awesome! These no machine ice creams are genius, though I do love my Kitchen Aid ice cream bowl attachment. This was such a sweet story. I’m so glad you shared it with us. And this ice cream is totally my style. I love lots of texture and crunch and different flavors. Can’t get enough! Thank you. Yep, I either love plain ice cream with tons of toppings, or ice cream packed with stuff, but then no toppings. Thanks for stopping by, and for pinning! Enjoy this – it is amazing! Congrats on 10 years! And what a great story. Geeky is totally cute! Thank you! Can’t believe it has gone by so fast! I love this story Brianne! When I first met my future husband, we were teenagers and I am 3 years older than him. He was my friends bratty little brother. 15 years later, I ran into him at my younger brothers wedding. We started dating instantly and 3 1/2 years after, he put a ring on my finger. So strange how love works out! PS – AMAZING recipe. Your killing my wedding diet! I too am a Jersey girl and we ALWAYS went down the shore! I miss those days now that I live in Florida! This ice cream looks amazing! I could not resist the over flowing chocolates! i love it! Haha, I was actually getting quite sad as it was melting – got it back into the freezer as quickly as possible! Looks amazing. Pinned for my next ice cream adventure. Thanks! I love these no churn ice creams! So many ways to change it up. I love the story of how you and your husband met, and even though I’m originally from Long Island, I totally got the we go to the shore reference! You know it’s like us saying we are going to “the city” i.e Manhattan! I must say, hard to believe this ice cream is no churn. 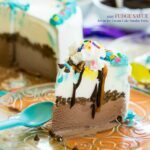 It looks incredible and I love that fudge ripple throughout! This no churn ice cream is genius – so many ways to change it up! I go to “the city” too, but when my friends in So. Jersey go to “the city”, they go to Philly. Too funny. Great post and over the top looking ice cream!! I love that song of Sarah McLachlan’s too!! What a great story! And a delicious sounding ice cream! Thank you! It was fun to relive it and write it down! “We don’t go to the beach. We go down the shore.” Jersey girls FTW! This ice cream is too much. It’s just too perfect. It kills me a little, but in a good way. 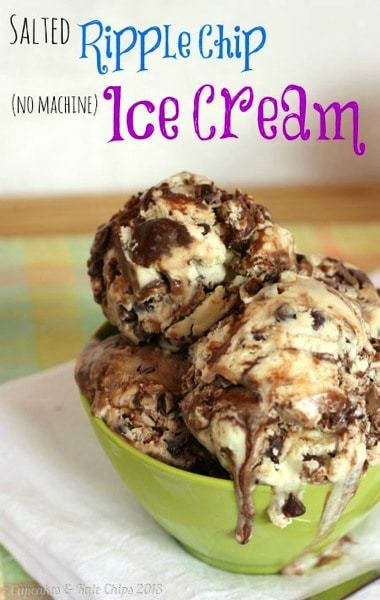 I love salted dark chocolate… so I know I would adore this ice cream! Looks great, you must have devoured this dish in no time flat! It went down a little TOO easily! This week was my first #sundaysupper and i love the theme so much it produced such good recipes! 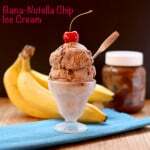 I just love this super indulgent Ice Cream! It sounds amazing! Welcome to Sunday Supper! The themes really help stretch your imagination! Brianne, HAPPY ANNIVERSARY! Great courtship story! And this ice cream sounds AMAZING!!! Thanks Luz! It was fun to relive those memories! Mark me down for also making ice cream with wayyyyy too many flavors/ingredients this week to make a catchy name for it 🙂 haha. 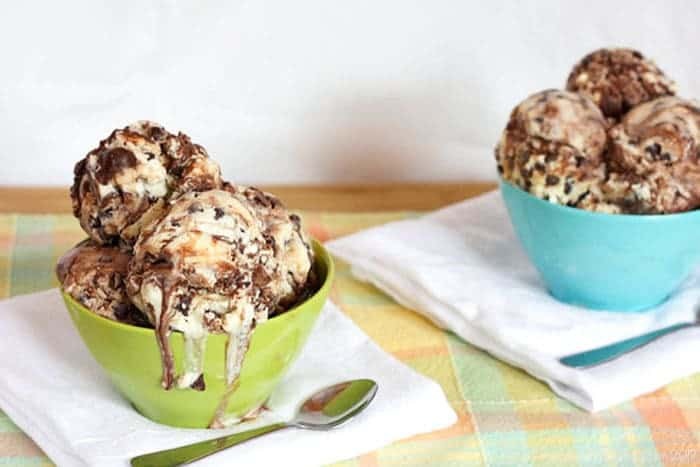 Your ice cream turned out amazing – I seriously CANNOT believe you made this without an ice cream maker. You’re so talented! Thanks Liri! Can’t take all the credit – got the basic idea from a few other bloggers out there with the basic recipe, but it was fun to jam too many flavors and textures into it. OMG. This is probably the best looking ice cream I’ve ever seen. You did such a great job on the pictures. Congrats on 10 years! I have a link party that starts tonight at 8pm EST. I’d love if you’d stop by! Fun story about “the shore”! And the ice cream looks delicious! Okay, that was just so sweet. And me, being the big baby that I am, am having a hard time typing through the tears in my eyes. I think that story (and your guys’ love) is definitely better than ice cream, but boy does this come close – YUM! Aww, you are sweet, Heather!! Love this. I made this for my husband for the first time a month ago and now he wants it at least twice a week! Please, please, please ship me a pint! Haha, I’ll get some dry ice! Geek is the new cool! This ice cream is ridiculously insane! Such a sweet story and I love how you feel about that song. Happy 10 years! Awww I loved your story about you and your hubby! SO sweet!!! and OMG this ice cream-so much deliciousness crammed into one thing! OVERLOAD OF YUM! I couldn’t resist the perfect timing to tell our story. And yes, yum overload, completely! What a sweet story of you and your husband! Love the ice cream too. Giggling over the second photo and understanding how challenging it is to photograph ice cream. One distraction is all it takes.